MathML allows an individual to express mathematical equations visually in an HTML format that can be read by screen readers. The World Wide Web Consortium recommends MathML format for creating accessible mathematical equations, which should be used to ensure all users can interact with course equations. 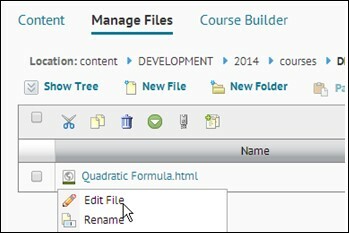 To create mathematical equations, use D2L’s HTML Editor, which can be found in several tools (e.g., Content: Create a File, News, Dropbox, Discussions, Quizzes, Surveys, Manage Files: New File, etc.). 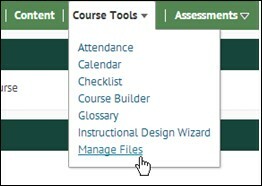 To create a new file with the HTML editor, click Course Tools on D2L’s navigation menu, and then click Manage Files in the drop down menu. Then select New File to open up a blank file with the HTML editor. To access the equation editor in the HTML editing tools, click the Show All Components ellipsis (…) to display all tools. Then select the Graphical equation icon. You may need to disable any pop-up blockers and install the most recent update of Java Runtime Environment from Sun Microsystems Inc. to ensure the graphical equation editor functions properly. 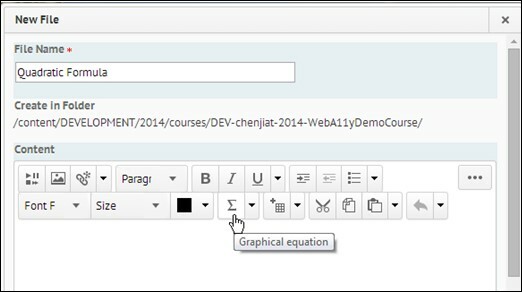 After opening the graphical editor, use the graphical equation toolbar to help construct your equations. Click Insert when you are finished constructing your equation. Your equation is now complete. If you wish to view an equation you’ve created prior to saving, click the Preview button located at the bottom of the HTML editor. 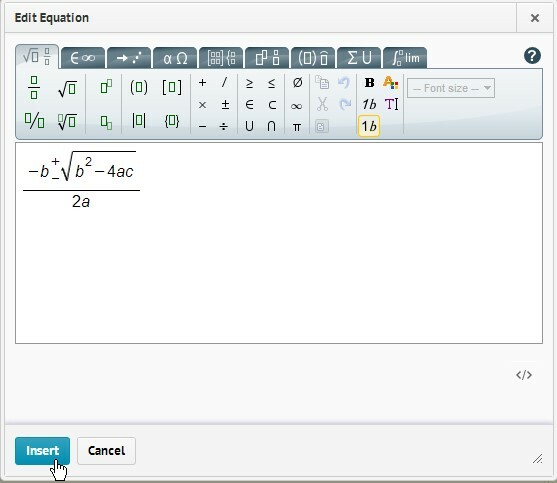 To edit already existing equations with the graphical editor, right-click the equation you would like to change, then click Edit File from the drop-down menu. Click the Show All Components ellipsis to expand the toolbar. You must first click your already-existing equation (place holder icon) to highlight it. 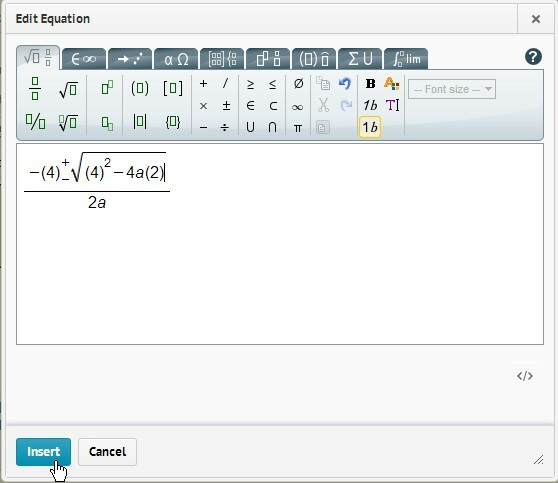 Then click the Graphical equation button to open the equation. Make any necessary updates and click the Insert button to update your equation. Clicking the </> symbol will show the MathML code that was created while using the graphical editor.